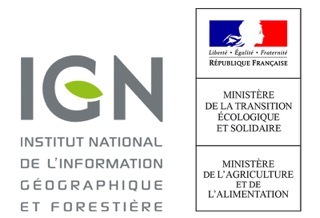 The growing-stock volume of the French forests is estimated at 2.7 billion cubic meters. This volume calculated by the NFI is the stem volume of live trees having a diameter at breast height superior to 7.5 cm, from the stump to a minimum 7 cm top diameter over bark. The growing-stock volume per hectare is 170 m³. Almost 2/3 (72%) of the growing-stock volume are in privately-owned forests. The volume per hectare is higher in state forests (193 m³/ha). The French forest is mainly a broadleaved forest (64% of the growing-stock volume and more than 2/3 of the total forest area). Broadleaved trees are mostly located in flat and low-elevation areas, except the Landes of Gascogne region in South-Western France, which is dominated by maritime pine, whereas the coniferous are in mountainous and Mediterranean areas (for more information, read the article "More than 140 tree species inventoried in France"). The oak wood volume accounts for 1/4 of the total growing-stock volume, beech for 10%, Norway spruce for 8% and silver fir for 8%. NB: The results are extracted from the inventory campains led between 2013 and 2017.